Browse our collection of 4 Aqua Pillows, Posters and more. Designed and printed in the USA. 100% Satisfaction Guaranteed. About this Design Show off your extensive and superior knowledge of the geography of the 'Merican landscape with this awesome canvas. You got Not Texas, also Not Texas, TURBO Not Texas, Aqua Texas, and The Chosen Land of Truth Justice and The American Way- Texas. Which by the way, makes up at least 700% of the US of A's total landmass, 100% of its freedom and contains the only 3 cities that ever mattered- Dallas, Austin, and Houston. 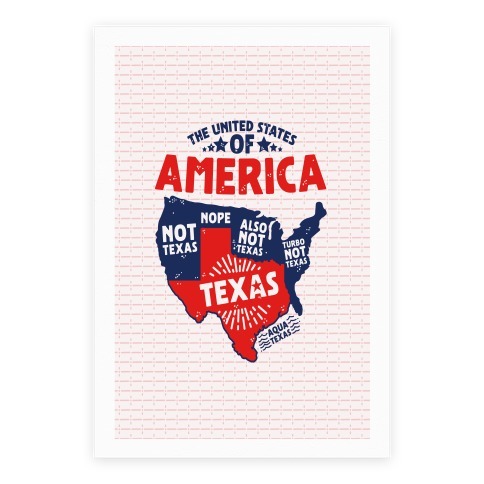 Show off your extensive and superior knowledge of the geography of the 'Merican landscape with this awesome canvas. You got Not Texas, also Not Texas, TURBO Not Texas, Aqua Texas, and The Chosen Land of Truth Justice and The American Way- Texas. Which by the way, makes up at least 700% of the US of A's total landmass, 100% of its freedom and contains the only 3 cities that ever mattered- Dallas, Austin, and Houston. About this Design Show off your extensive and superior knowledge of the geography of the 'Merican landscape with this awesome tote bag. You got Not Texas, also Not Texas, TURBO Not Texas, Aqua Texas, and The Chosen Land of Truth Justice and The American Way- Texas. Which by the way, makes up at least 700% of the US of A's total landmass, 100% of its freedom and contains the only 3 cities that ever mattered- Dallas, Austin, and Houston. 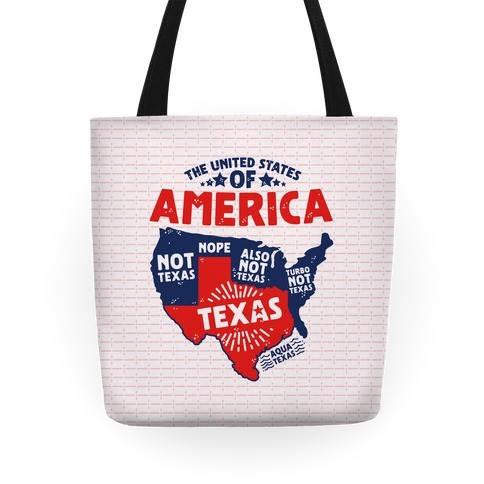 Show off your extensive and superior knowledge of the geography of the 'Merican landscape with this awesome tote bag. 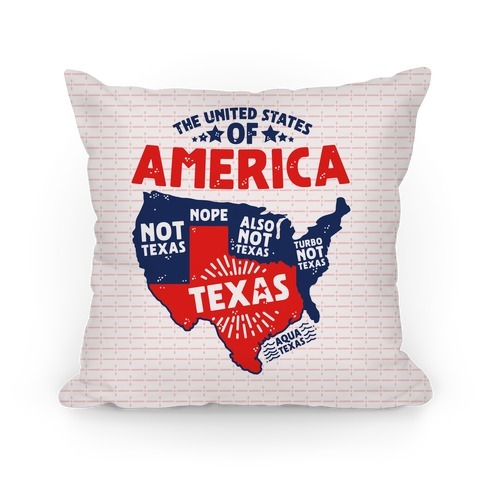 You got Not Texas, also Not Texas, TURBO Not Texas, Aqua Texas, and The Chosen Land of Truth Justice and The American Way- Texas. Which by the way, makes up at least 700% of the US of A's total landmass, 100% of its freedom and contains the only 3 cities that ever mattered- Dallas, Austin, and Houston. About this Design This patriotic design features the phrase "USA all day" and is perfect for showing your undying love for the greatest nation on earth: 'Merica! Ideal for barbecues, the 4th of July, memorial day, drinking beer, and enjoying freedom! 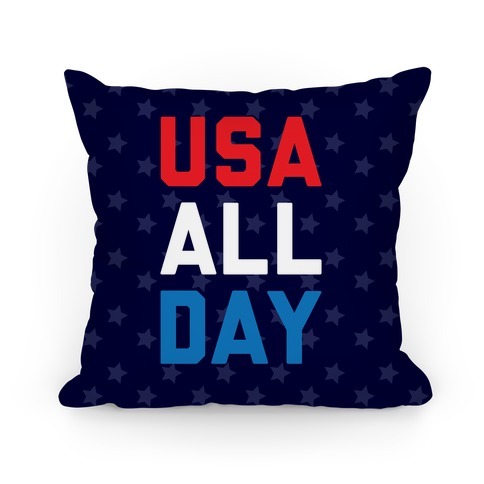 This patriotic design features the phrase "USA all day" and is perfect for showing your undying love for the greatest nation on earth: 'Merica! Ideal for barbecues, the 4th of July, memorial day, drinking beer, and enjoying freedom!